St. John’s, Antigua. 21st May 2010. Antigua & Barbuda’s Dame Yvonne Maginley DCN, CMG, OBE, OD has been recognized by the Caribbean Tourism Organization (CTO) for her outstanding contribution to the development of tourism in the Caribbean. Dame Yvonne has been awarded the prestigious Lifetime Achievement Award which is bestowed on high performance individuals who have truly made a difference in the Region by empowering individuals and providing a legacy for future generations. Dame Yvonne was nominated by the Antigua & Barbuda Tourism Authority and was selected by a panel of independent judges from a list of very outstanding, accomplished and distinguished nominees. Dame Yvonne began her career in tourism in 1958 as Executive Secretary to the Antigua Tourist Board, a position she held for 15 years. By the early 1960s the Eastern Caribbean Tourist Association (ECTA) was formed with the objective of pooling national marketing resources to create greater visibility for the smaller islands of the sub-region. In 1971 Dame Yvonne was elected Chairperson of ECTA where she was responsible for marketing the sub-region. She also provided assistance to member states on product development and planning. By 1973 she had assumed the role of Executive Director of ECTA; a position she held for 11 years. In 1984 Dame Yvonne was appointed the first female Director General of Tourism for Antigua & Barbuda. Whilst holding this position Dame Yvonne was named “One of the Most Powerful Women (worldwide) in Travel” by Travel Agent Magazine for three consecutive years. In addition to her long standing career in tourism Dame Yvonne is well known for her community service. 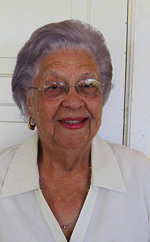 She was a founding member of the Antigua Community Players and has served as their Musical Director since 1957. She has composed many national and folk songs which have been used to promote Antigua & Barbuda. She is also a member of the Board of Trustees for the Betty’s Hope Trust. In 2004, she was invested as a Dame Commander of the Most Distinguished Order of the Nation (DCN) and has served as the Governor-General’s Deputy. Dame Yvonne will be presented with her award on Friday 11th June, 2010 at the 37th Annual Governments of the Caribbean State Ball and Awards Presentation to be held at the Plaza Hotel in New York City.